Former CIA operative Robert Baer pushes fiction to the absolute limit in this riveting and unnervingly plausible alternative history of 9/11. Veteran CIA officer Max Waller has long been obsessed with the abduction and murder of his Agency mentor. Though years of digging yield the name of a suspect—an Iranian math genius turned terrorist—the trail seems too cold to justify further effort. Then Max turns up a photograph of the man standing alongside Osama bin Laden and a mysterious westerner whose face has been cut out, feeding Max’s suspicion. When the first official to whom Max shows the photo winds up dead, the out-of-favor agent suddenly finds himself the target of dark forces within the intelligence community who are desperate to muzzle him. Eluding a global surveillance net, Max—in the summer of 2001—begins tracking the spore of a complex conspiracy, meeting clandestinely with suicide bombers and Arab royalty and ultimately realizing the Iranian he’d sought for a decades-old crime is actually at the nexus of a terrifying plot. 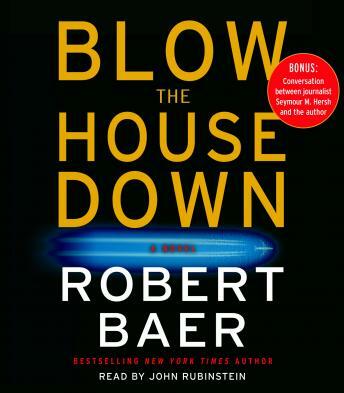 Showing off dazzling tradecraft and an array of richly textured backdrops, and filled with real names and events, Blow the House Down deftly balances fact and possibility to become the first great thriller to spring from the war on terrorism.